Hostel is located on a street where there are Şota of nice cafe’s & boutique hotels / shops by the river. Although it looks a bit far from the old city it is still within a 15-20’ walking distance. Rooms are comfortable & clean. They even have a massage room / service anytime you want. Very nice family runs the place, they are very helpful. We will highly recommend this place. 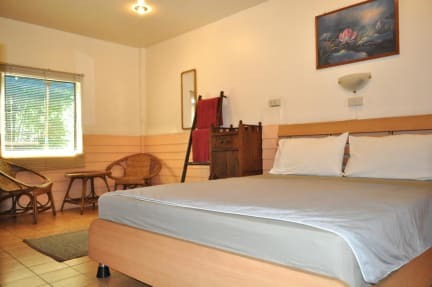 Very comfortable stay, very clean, AC working, no mosquitoes or insects. Had a really great time and extend my stay. Highly recommended! My boyfriend and I stayed 3 nights and we really liked it. Beautiful place, feels very natural with the fish pond and the plants. Staff was nice, they printed us something that we needed :) The double private room has plenty of space, hangers, chairs, a little table, fan and AC. Private toilet and shower. We recommend the place!! Great place to be. A bit outside of the old city, on the other side of the river, but on the other hand a) there are lots of bars and restaurants near the river (I liked the backyard café) and b) they have bikes you can borrow for free. Friendly and helpful staff; I felt welcome staying there. Quiet, nice staff, good value. 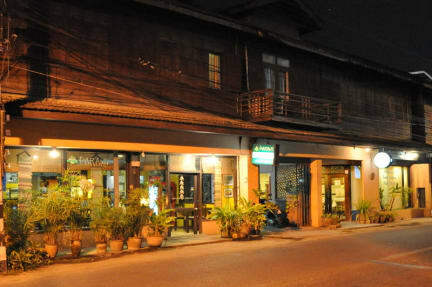 Well located for the Old City and Night Bazaar, peaceful, quaint and charming. Staff were generally friendly, though didn’t seem overly fussed we were there. Negatives: Bed bugs! We slept under a net as there were mosquitoes abound, but realised after the 2nd night there were bed bugs - the 35+ bites on my feet don’t feel great! Ensuite was grubby, and an entry point for mosquitoes. Floorboards in room above made for loud banging at all hours. No atmosphere - didn’t see other guests at all. This is less of a hostel and more of a budget hotel. it is not social, and there is no atmosphere to speak of. The location is a little far from everything. On the bright side, they do make bikes available for patrons to use. They also rent scooters.